BRISBANE ranks 13th highest in the country for regions affected by homelessness, St Vincent de Paul Society Queensland state president John Forrest announced as he launched Vinnies’ Winter Appeal for 2016. There are 9700 homeless people in Brisbane on any given night, an alarming 1.97 per cent of the population, and Queensland takes out five of the nation’s top 20 spots for homelessness, according to the report Fact File: Without a Home. And alarmingly, women over 55 made up the majority of homeless people seeking help from specialist homelessness services such as Vinnies, Mr Forrest said. Vinnies’ Winter Appeal, themed “Rethink Homelessness”, highlights the misconception that women are less affected by homelessness, when in fact the majority of Australians turning to specialist homelessness services are female. A total of 8504 females face homelessness across the state, and children under 12 account for 17 per cent of that figure. Mr Forrest said one recent example was a woman in her early sixties with a solid working history. “Mary was made redundant at 62 after working in her job tirelessly for more than 20 years, then found herself on the streets after she was evicted from the home she’d rented for 12 years,” he said. “She told us, ‘All it took was a couple of things to go wrong before I found myself on the streets’. “This is the reality many face before they turn to us for help. Mr Forrest said national figures showed 59 per cent of Australians seeking help from homelessness services were women. “That’s a significantly higher rate than the UK’s twebty-six per cent and the USA’s thirty-eight per cent. This is a devastating figure and Queensland is not immune to this reality,” he said. 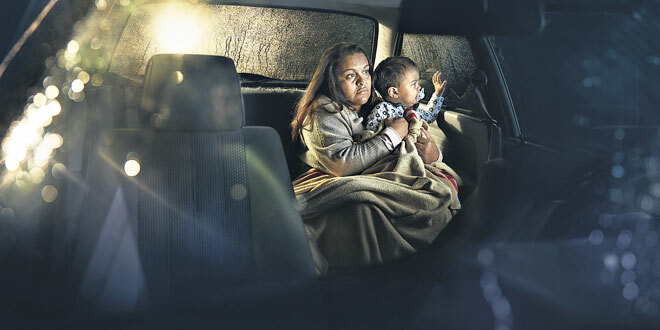 Across the country, more than 45,000 women face homelessness and on any given night, and among them are 2200 Australian women “sleeping rough”. Mr Forrest said the number one reason contributing to homelessness in Australia was domestic and family violence. About 36 per cent of women who accessed homelessness services have experienced domestic and family violence. Also 28,758 are children under 18, and 61 per cent are children aged under 12. Mr Forrest said the statistics were shocking and that Vinnies was working hard to meet the demand from women and children for support and services. “Our volunteers and members regularly provide a hand-up to women experiencing disadvantage and homelessness. Central to the Winter Appeal is the work undertaken by our dedicated members, volunteers and staff, assisting the people who turn to us and making a real difference to their lives,” he said. In the 2014-15 financial year the society assisted about 296,500 people and provided $29.7 million worth of financial assistance. “It is heart-breaking that the numbers we serve are increasing every year,” Mr Forrest said. Donate to the Vinnies 2016 Winter Appeal and help them continue to change lives every day.